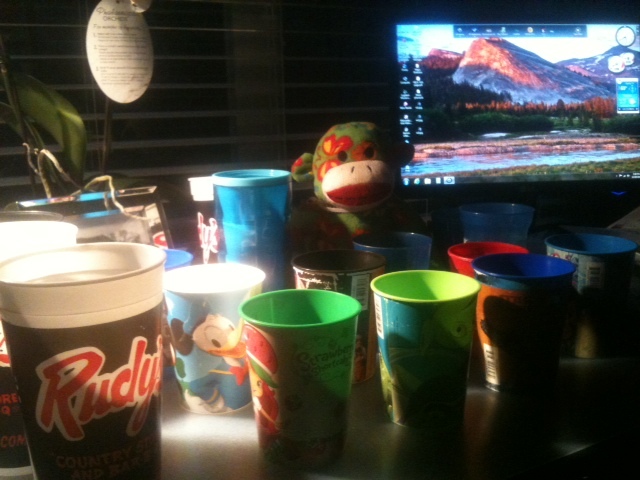 During this spring of this year, a little sock monkey named Leo began traveling around North America. His journey started at Debbie’s place, Miss. Deb: Confessions of a Triplet Mom. He has been to New York, Michigan, Las Vegas, Indiana, North Carolina and Canada. He arrived in the big old state of Texas just last week to see me! I felt AWFUL that he was stuffed in a box and that he truly has no home to call his own. A homeless sock monkey! The box he lives in has no holes or ANYTHING! 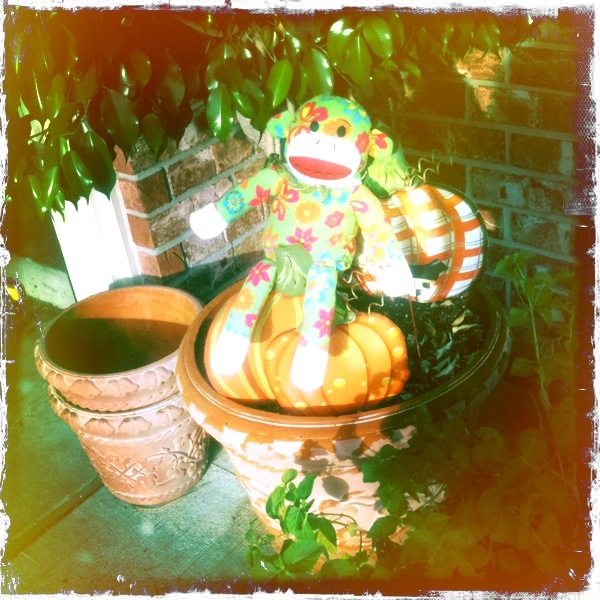 Fortunately, sock monkeys are exceptionally good at holding their breath, so he seemed to be fine when I took him out. Before we knew it, he was outside trying to show me his gymnastic moves. He kept yelling, “See how I can keep my legs straight! Notice the strength I have in my legs? 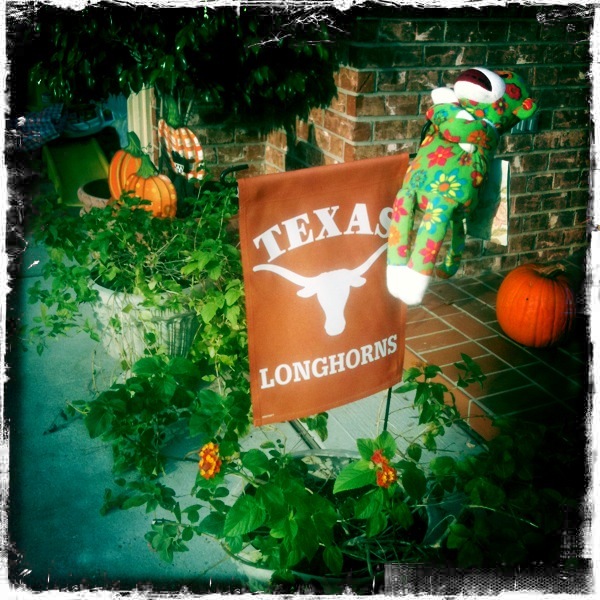 This isn’t easy!” He wanted us to try it, but I told him a Texas Longhorns flag stuck in a potted plant wouldn’t hold up our weight. That’s when he yelled, “Lose weight then!”, which hurt pretty badly. I thought sock monkeys were always kind. I bet he was super kind before he went to Las Vegas. That probably really changed him. Maybe he was grumpy due to having to move so often. Or maybe he gambled away his retirement? His mood quickly improved when he it was time for another photo opportunity. After pointing out that I had two empty planters that needed to be filled, he situated his cottony behind on my metal pumpkins and smiled. He really is photogenic. The next thing we did was to explain to Leo that he was in a state that was known for having lots of cowboys. 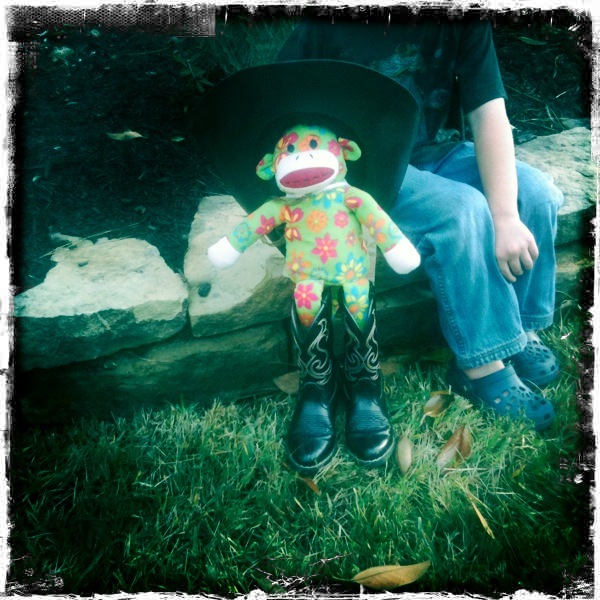 He was really bummed we didn’t have any cows or horses in our yard and asked me what type of host would accept a traveling sock monkey without being adequately prepared. Later today, we may drive past some pastures with cows and horses in them if Leo straightens out that attitude. Anyway, we DID have a cowboy hat and boots both of my sons have worn to the Houston Livestock Show and Rodeo that fit Leo pretty well. Once my three-year-old there got Leo all dressed, Leo started saying “y’all” over and over. He asked if I had any Skoal he could dip. When I said no, he grabbed a long stalk of grass to chew on and then realized his mouth was sewn shut and full of cotton. He was pretty down about that for a few minutes. I’m going to miss that Leo.